Temperatures for the Front Range will be getting warmer over the next few days with plenty of melting! 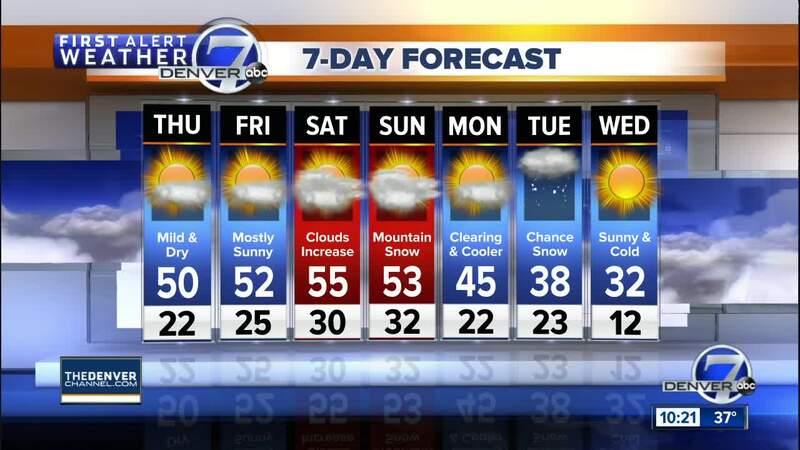 Highs will be in the 50s for Thursday through Saturday with mostly sunny skies in Denver and across most of Colorado. A a quick moving storm system will pass across Colorado Saturday night and Sunday with 4 to 8 inches of snow for the mountains, but just a few flurries or sprinkles of rain for the eastern plains. The recent cold wave in the Midwest does not mean the our world is not experiencing global warming due to the increase in CO2. This is simply a regional cold event. In fact, it is warmer in Fairbanks, Alaska right now than it is in Denver! If you want to learn more about what is happening, read this essay on Denver7's Meteorologist Mike Nelson's Facebook page or scroll to the bottom of this page. The weather early next week will turn colder with another chance for snow by next Tuesday.